Theresa May will say the main aim of her post-Brexit plan for Britain is to “build a more united nation” during a visit to Scotland on Monday. The prime minister is also due to meet First Minister Nicola Sturgeon. Ms Sturgeon wants to hold a second independence referendum in autumn 2018 or spring 2019, but Mrs May has said “now is not the time”. The Scottish government said there were “a lot of areas” they wanted answers on ahead of Article 50 being triggered. That is due to happen on Wednesday, formally beginning the process of the UK leaving the EU. Ms Sturgeon says a second referendum should be held ahead the UK’s EU departure to give the people of Scotland a choice between what she calls a “hard Brexit” and becoming an independent country. During her visit on Monday, the prime minister will also meet officers from Police Scotland to discuss counter-terrorism issues. A debate at the Scottish Parliament on whether to seek permission for a referendum will resume later this week after being halted due to the terror attack in Westminster. Do voters want a second referendum? Ahead of her meeting with the first minister, Mrs May will address staff at the Department for International Development in East Kilbride. 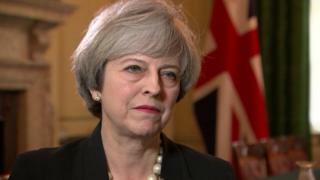 She will say “the strength and stability” of the Union will “become even more important” as Britain leaves the UK – and the “one overarching goal” of her post-Brexit plan is “to build a more united nation”. “A more united nation means working actively to bring people and communities together by promoting policies which support integration and social cohesion,” she will add. The prime minister will praise the work done by the department around the world and will insist this will continue after Brexit. “UK Aid is a badge of hope for so many around the world,” she will say. “It appears on the side of buildings, school books, medical supplies and food parcels in some of the toughest environments and most hard-to-reach countries on the planet. Ahead of the visit, a spokesman for Scotland’s Brexit Minister Michael Russell said the first minister was looking forward to discussing the security situation with Mrs May in the wake of the Westminster attack. He added: “We understand the UK government wishes to discuss Article 50. “Given we are just days from the formal process of Brexit being triggered there have, as yet, been no discussion with the Scottish government over what will be in the letter triggering departure from the EU. Mr Russell said there had also been no discussion over the the financial impacts of Brexit and “the consequences for jobs and the economy in Scotland”. He added: “There are clearly a lot of areas where we hope the prime minister intends to provide answers.